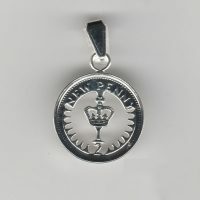 1971,1973,1974,1975,1976,1977,1978,1979,1980,1981 coin pendant or coin necklace made from a Decimal Halfpenny coin. 1979 is 40th birthday. Coin jewellery made from a Decimal Halfpenny. Halfpenny-Coinwear. This Decimal Halfpenny coin necklace has been hand cut from the original coin and Silver plated to a high quality. It is available in the following years: 1971, 1973, 1974, 1975, 1976, 1977, 1978, 1979, 1980, 1981. Available from 1971-1981. 1979 is a 40th birthday or anniversary.